Best Advice I Ever Received: “Slay the dragon”, meaning face up immediately to any challenge; don’t dwell on it. Better to make a mistake than doing nothing at all. Best Advice I’d Give To Someone Who Wants To Build A $10m+ Business: Focus – there are opportunities every day, but stay on track with the one that is going to be the core of the business. The start of Tony’s entrepreneurial journey. Keep your eyes open – that’s when things happen. The start of Just Water and the life cycle of Tony’s side companies. “Slay the dragon”, meaning face up immediately to any challenge; don’t dwell on it. Better to make a mistake than doing nothing at all. Always look ahead. The numbers of history are behind you. Look at what’s happening in the next month, the next quarter, the next year, and beyond. Creating a brand has power. 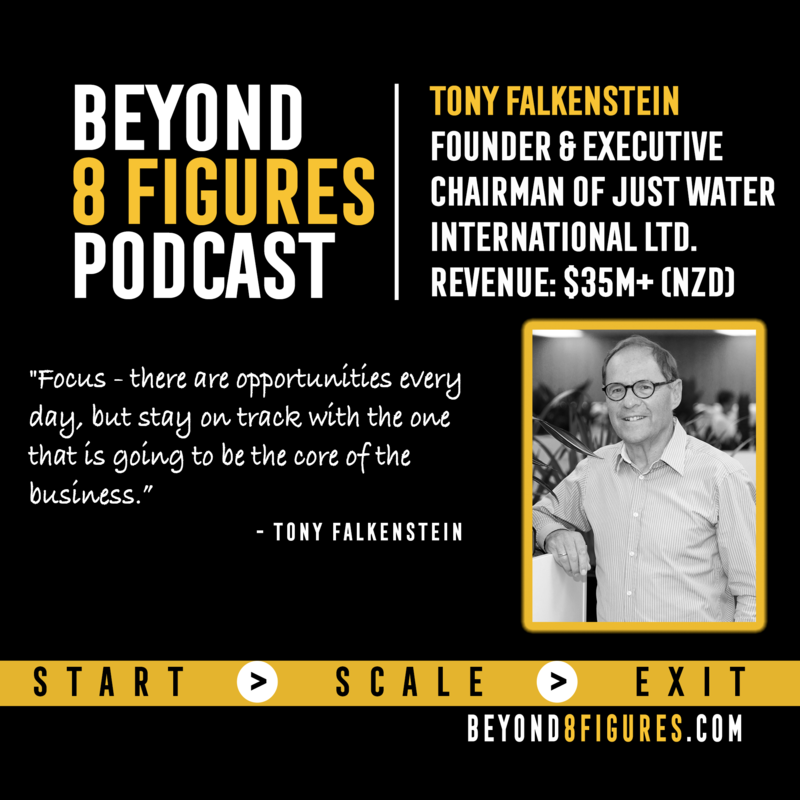 Tony Falkenstein ONZM is the Founder and Executive Chairman of Just Water International Ltd. He was instrumental in launching New Zealand’s first Business High School, at Onehunga High, resulting in ‘business’ being added into the New Zealand curriculum. Tony was inducted into the New Zealand Business Hall of Fame in 2008, and in 2010 was appointed as an Officer of the New Zealand Order of Merit (ONZM). In 2012 Tony received the Award for New Thinking in the World Class New Zealand Awards, in 2013 he was appointed a Distinguished Alumni of the University of Auckland, and in 2014 he received the Alpha, Beta, Gamma distinction.